Beat the cream cheese and 1/2 cup butter in a bowl, then stir in the flour. Cover and refrigerate for about an hour, until the dough is firm. 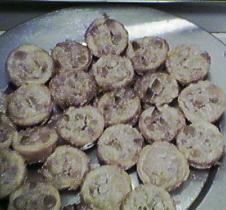 Shape into 24 balls (each should be about an inch); place into ungreased small muffin cups, pressing the dough onto the bottoms and sides to make little cups. Heat the oven to 350º F, then combine sugar, egg, butter, lemon juice, and extract for the filling. Stir until smooth and then add the peanut butter chips, then fill the cups (2/3 full) and bake 20 to 25 minutes, the filling should be set and the cups lightly browned. Cool and then remove onto rack. Garnish with candied cherries if desired.